We got to know yesterday about the unavailability of buses between Guwahati and Shillong. 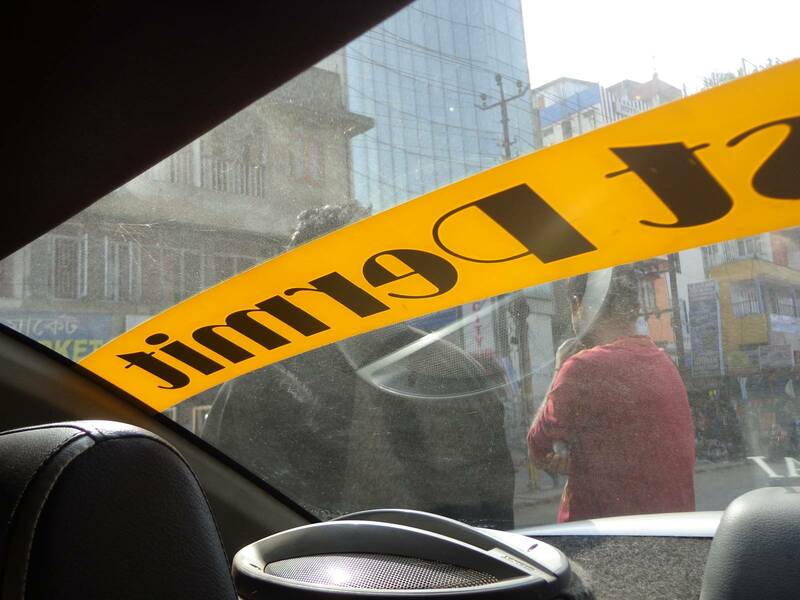 However, there are abundant private vehicles that leave from Paltan Bazaar and cover a distance of about 120 kms in about 2.5 to 3 hours. The larger SUVs can carry about 8 passengers while the smaller sedans carry about 4. The latter is a bit more expensive but the rider pays for the comfort. The entire ride is shared and there are – for lack of a better word – brokers who ensure that the vehicles are packed to their full capacity. This isn’t such an easy task as these vehicles are not allowed to park and attract potential passengers. The taxi drivers end up paying to them as well as to the traffic guys. I asked our driver about the number of trips he makes everyday to which he replied that a single to and fro is enough for him, roping in about 2000 per day. 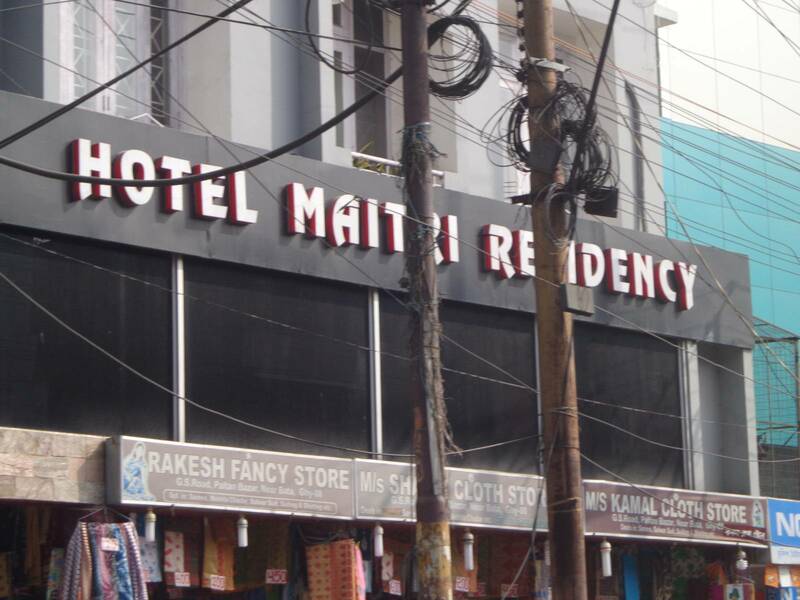 Our Hotel in Paltan Bazaar, Guwahati. The driver even drove in circles in order to get another passenger. We ended up paying 50 rupees extra for the lack of fourth passenger. The allies / brokers / helpers – whatever you may call them – they are there to attract passengers and help fill up the seats of a departing vehicle. National Highway 40 or Guwahati-Shillong road connects these two places. The first half was pretty bad in terms of road quality,. However, the road gradually improved as we approached Shillong. A lot of the regions suffered bottlenecks due to construction activities. Meghalaya has had a very unstable political ruling so far. It has only been five years or so that some kind of political stability has been obtained. As a land-locked state, it needs good road connectivity to improve its economic condition. These kind of public infrastructure construction activities are absolutely needed for the benefit of its residents. Shillong itself is a nice and clean place. The roads are not that wide. Since the area is hilly, widening these roads is next to impossible. For its size, it vehicle density is quite high. As a result, jams near important junctions are inevitable during working hours. 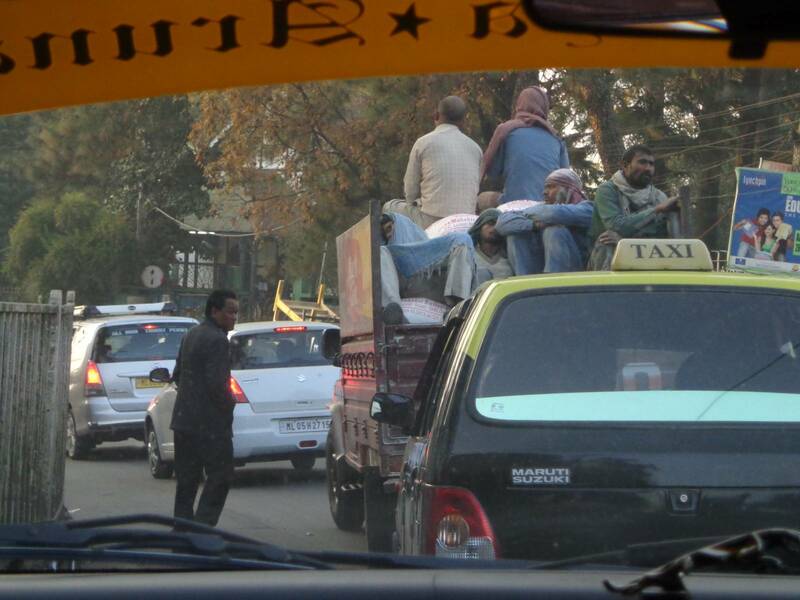 While entering the city centre (Police Bazaar), we were stuck in a jam for about a kilometer. Nandy had already shortlisted a few hotels. We ended up booking a room in the first hotel itself, thus skipping the hunt we had done yesterday. 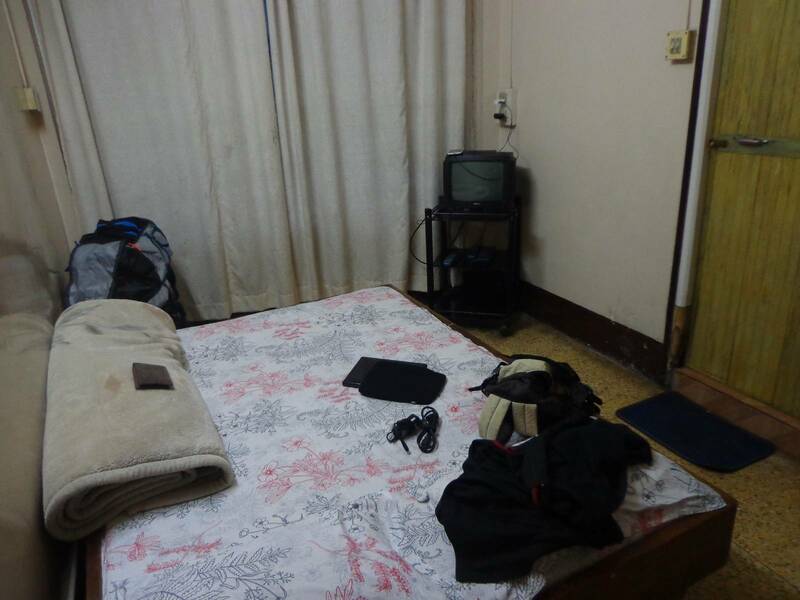 This room of Hotel Swastik was smaller and cheaper than the one we took in Guwahati. Police Bazaar is a busy place. 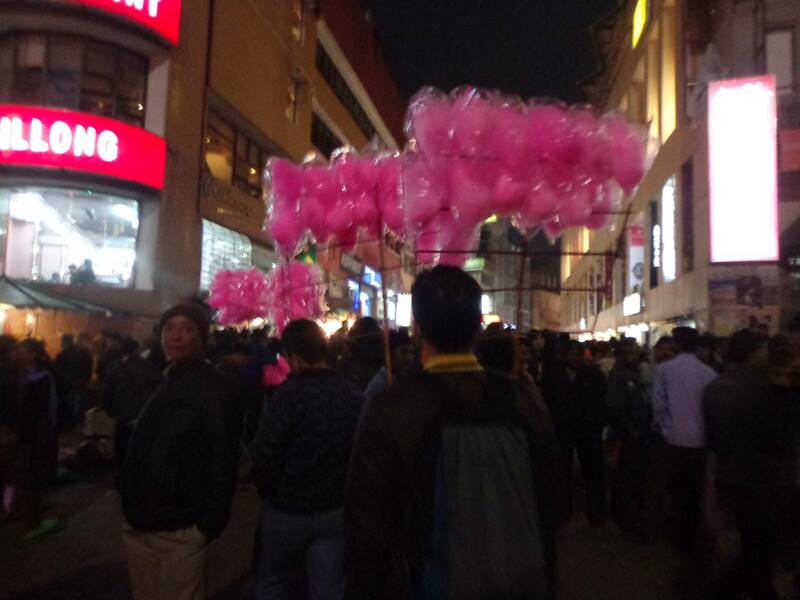 Judging by the kind of shops that decorate either sides of this area, I felt that people in Shillong are in general well off economically when compare to a city like Guwahati. Tourism is an important source of income. Wikipedia notes that insurance and banking is another. There are a lot of banks and other financial institutions including ones that operate locally. Police Bazaar is a very crowded place. The State Central Library is about a kilometer from Police Bazaar. 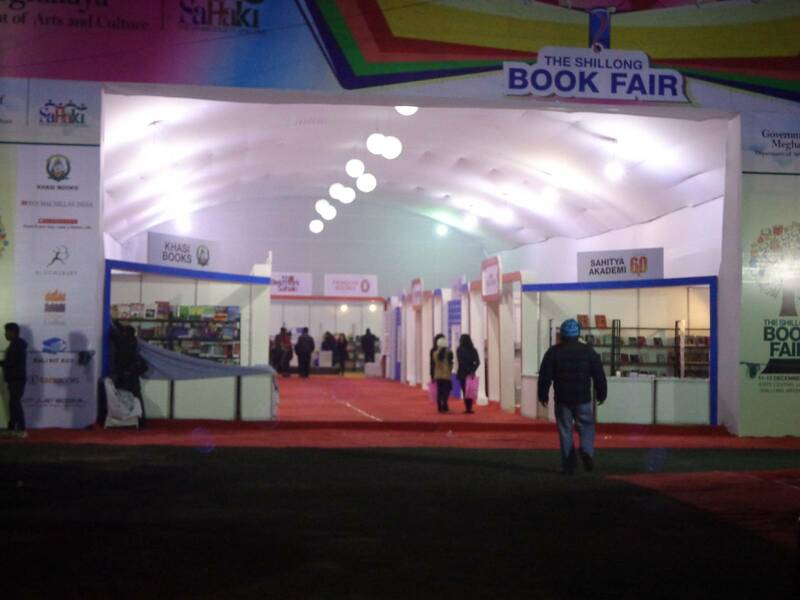 A three day book fair was being held in its premises. There were only seven stalls. A small Chennai based publisher called Tara Books also had a stall. They had an interesting catalogue of graphical books. Some of these books were hand made. The stall owner said that their books are available at Blossoms in Bangalore. It would be easier for me to pick them up from there. Shillong Book Fair. There was also a shop that stored Marvel comics stuff. I was disappointed to find character books and colouring albums of Marvel instead of their graphic novels. 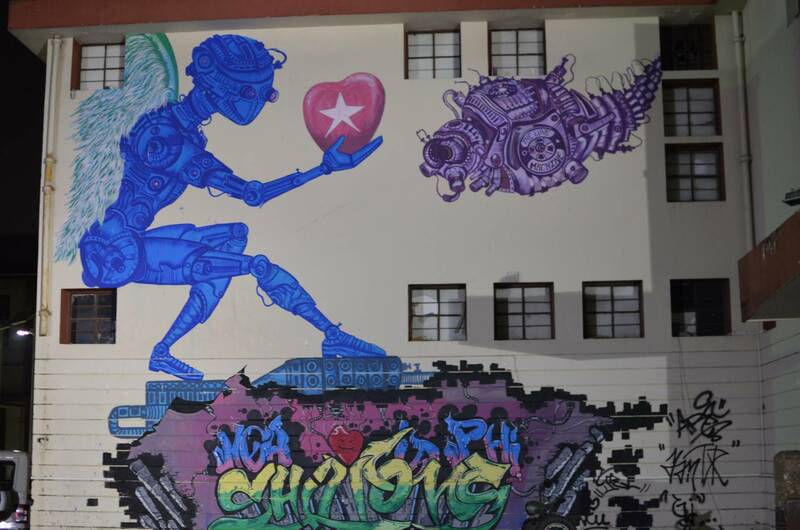 One of the walls of the State Central Library has this amazingly detailed grafitti. After yesterday’s disappointing food trip, Shillong was a welcome change. 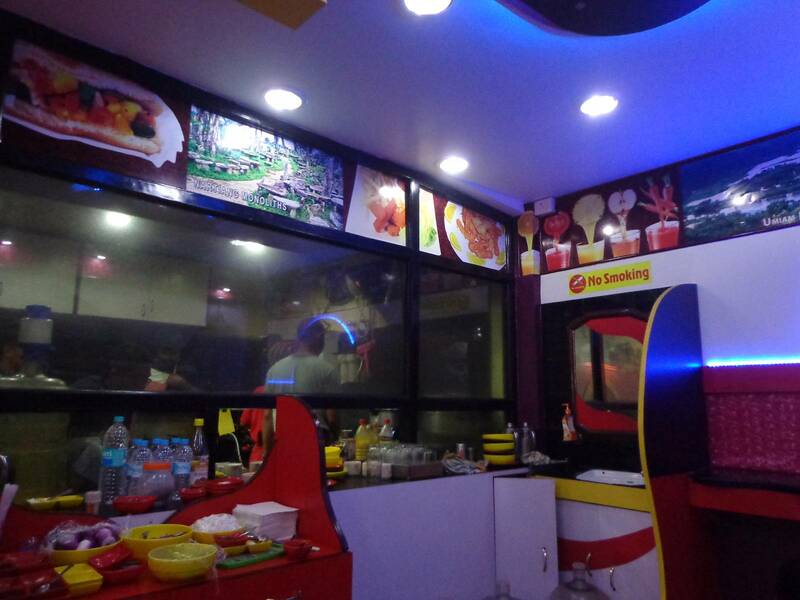 For evening snacks, we entered a small fast food joint called Fast Spin near our hotel. The momos were lightyears ahead of what we had yesterday. The colourful interior of Fast Spin. The kitchen is visible through the glass. 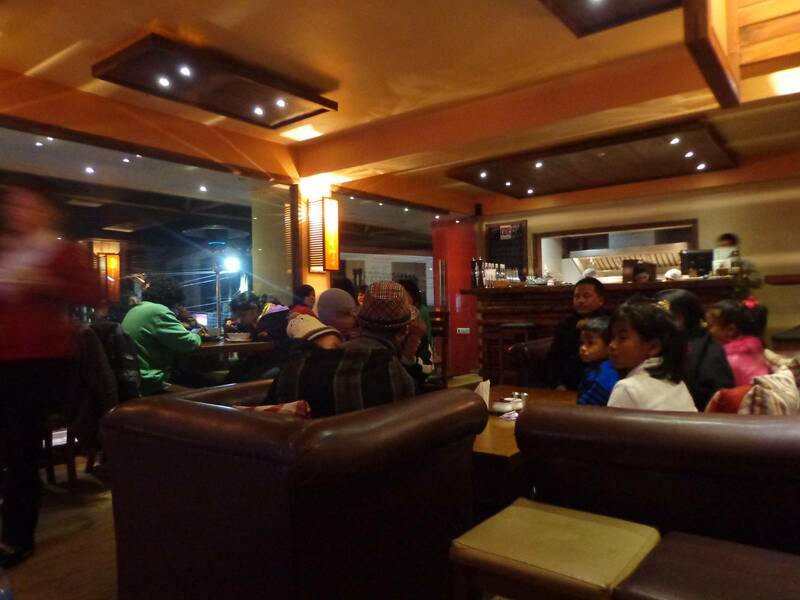 For our dinner, we walked almost 2.5 kilometers to Cafe Shillong. There was a small stretch of road called Jacob’s Ladder that had insane inclination. It felt like trekking. The food was well worth the effort. I haven’t tried other places but TripAdvisor’s no. 1 rank might be justified. 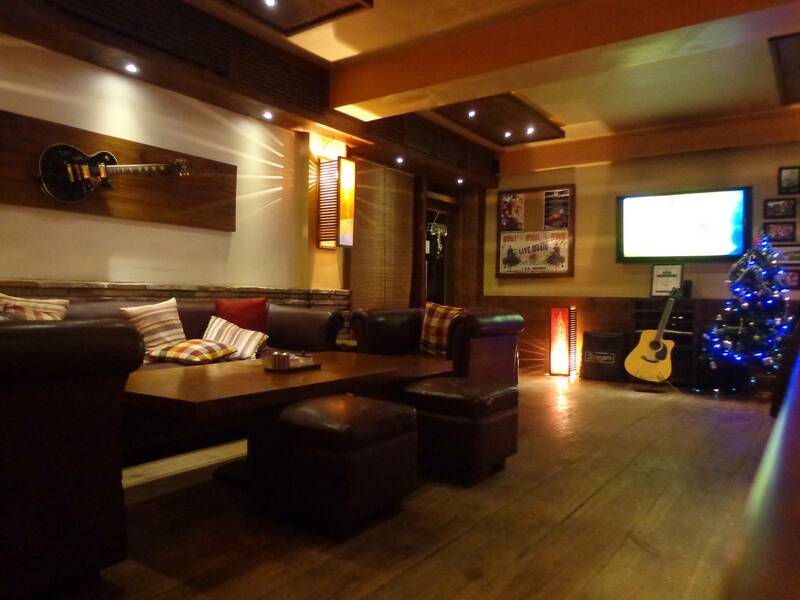 It mostly serves non-alcoholic beverages, continental and some local dishes. By the time we had placed our orders, the cafe had filled up. We were asked to shift to a smaller table to accommodate the sudden crowd. This is what he earns from the trip and is not his profit. He has to pay his “brokers”, the police and any cost associated with the vehicle, viz., fuel, etc. This place had good 3G reception. It was an important factor in finalising the deal. Our initial target was TripAdvisor’s no. 2, Deja Vu. It so happened that Cafe Shillong was en route and we decided to have our dinner there instead. 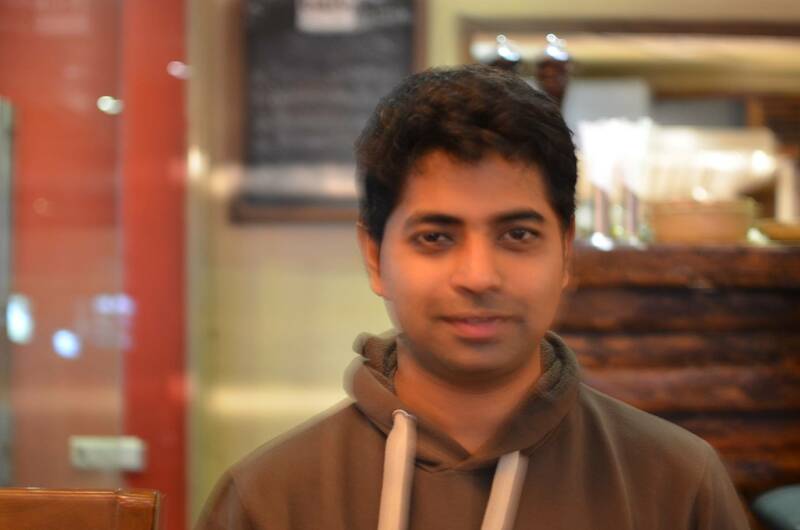 A hazy portrait of me by Nandy. The lighting was really low. Nikon D5100 has a good sensor + processor combo.